A year ago, Jamon Morgan was looking for a way to help Alaska teens in transition. “There’s nothing really out here for them,” said Morgan, the founder of New Direction Alaska. While he originally hoped to build a transitional home for older teens and young adults moving out of the foster care system, he said the logistics of securing a permanent facility were daunting. So, the nonprofit New Direction was founded as an outreach program Morgan runs in partnership with other local organizations. Morgan said New Direction teaches life, social and technical skills to Alaska teens. This summer, it’s hosting a series of weekend networking nights featuring music, free food, gym time, motivational speakers and more. They’re called NFOS — “no fear of success” — and Morgan said it’s a way to keep teens occupied during long summer nights. Morgan said the networking nights aim to teach teens skills necessary for a life of independence and success. About 20 kids showed up at the first event, and Morgan said they moved the party to Mountain View to make it more accessible for teens with limited transportation. Downtown, he said, the buses cut off too early. 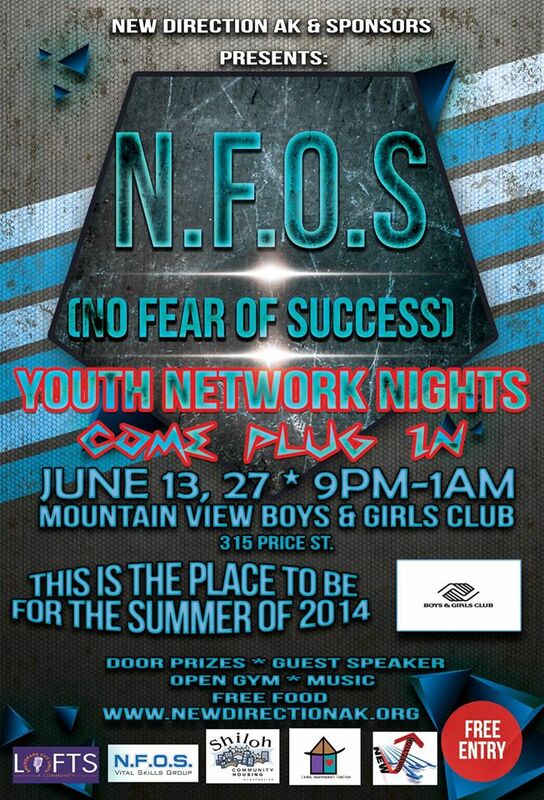 The youth network nights are set for June 13 and 27 at the Mountain View Community Center. The events run from 9 p.m. until 1 a.m., and Morgan said he hoped to host two every month throughout the summer. “It’s such a big need,” he said.